Cream the the sugar, peanut powder, butter together. Blend in one egg at a time until smooth. Add the vanilla or almond essence and mix well. Sift the salt, soda and flour together. Mix in the cinnamon and nutmeg. Then stir the flour into creamed mixture. Roll into balls, diameter about 1” or 1½"(for larger cookies), and placed on greased cookie sheets (about 5" apart). 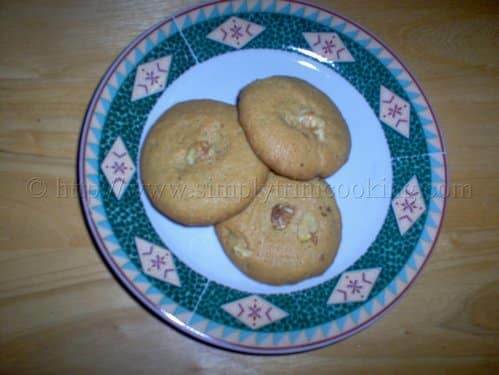 Place a piece of almond in the centre of each cookie and flatten slightly. Bake in a preheated 325°F oven for 15-18 minutes.